The yield curve, a key economic indicator that has been used to predict recessions, turned negative Friday, sending stocks plummeting. Investors were, in part, reacting to a move by the Federal Reserve that signaled it is more pessimistic about the future economy. The investors’ response led to this crucial measure becoming inverted from its “normal” state. Here’s how the yield curve works: When investors buy bonds, they are lending the government money. The Treasury then pays back interest on that money each year and returns the full amount to investors whenever the bond reaches the end of its set term — or, as it’s called, its maturity date. The yield on a Treasury bond is the interest rate the U.S. Treasury is offering investors to get them to lend it money. Typically the government pays a higher annual interest rate for long-term bonds than short-term bonds because investors are letting the government borrow their money for a longer amount of time. But on Friday, the opposite was true — the yield on the 10-year bond dropped below the three-month bond for the first time since 2007. 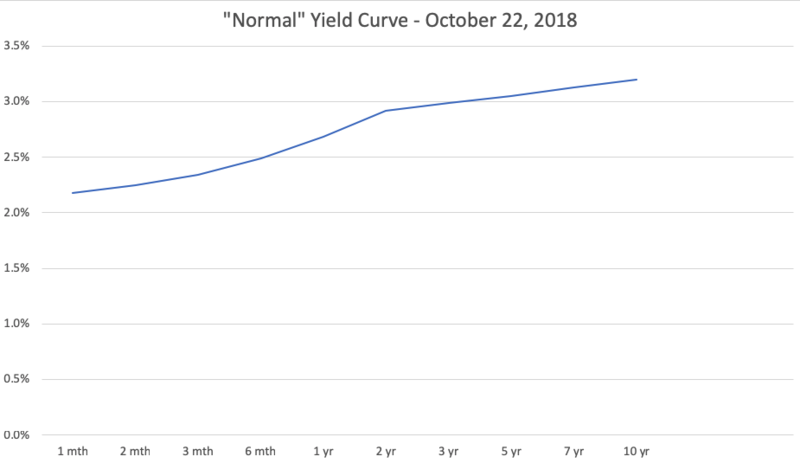 In “normal” circumstances, this is what a yield curve looks like. See how the curve tilts upward? On Oct. 22, 2018, the yield — or interest rate — on the 10-year Treasury bond was 3.22 percent. The yield on the three-month bond was lower — 2.34 percent. But something changed Friday. The yield curve was “inverted” and looked like this. See how the curve dips and the 10-year interest rate is slightly below the three-month rate? What investors are always watching is the yield on the 10-year Treasury. 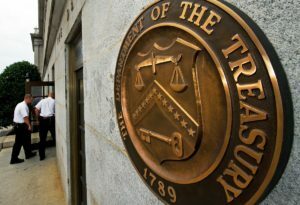 As of Friday, that yield had dropped to about 2.44 percent, but the yield on the three-month Treasury bond was slightly higher, at around 2.46 percent. Why is that? Basically, investors are buying more of the 10-year bond. And based on the rules of supply and demand, that pushes the interest rate down. So why are they buying more? Basically, it’s a signal they may be betting the economy is going to slow down. What is making investors pessimistic? The Federal Reserve announced last week it is not planning any more interest rate hikes. That could be taken as a sign it, too, is pessimistic about the economy — even that a recession might be down the road. A slowdown in European and the Chinese economies, trade disputes between the U.S. and China, growing corporate debt and concerns over Brexit have all caused investors to become gloomier in recent days. The latest news was just “the straw that broke the camel’s back,” said Diane Swonk, chief economist at Grant Thornton. The yield curve has been fairly “flat” in recent months, meaning the difference in the short and long-term bond yields has been fairly small for a while now. A flat yield curve is often seen as a sign of slower economic growth. But Former Fed Chair Janet Yellen downplayed the idea a recession was a foregone conclusion at a Credit Suisse investors conference on Monday in Hong Kong. Markets run on psychology, not just the fundamentals. 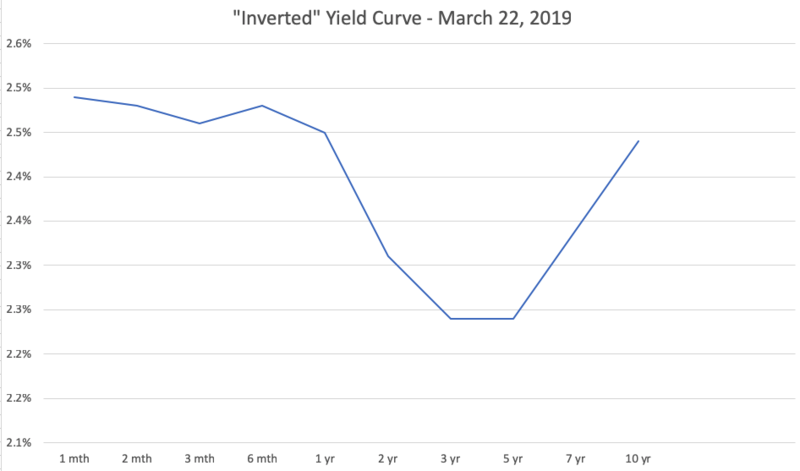 The inverted yield curve “might signal that the Fed would at some point need to cut rates, but it certainly doesn’t signal that this is a set of developments that would necessarily cause a recession,” Yellen said. So are investors’ fears justified? “The bond market is not irrational, but observers may be a little irrational in concluding from that that the recession is imminent,” said David Wessel, a fellow at the Brookings Institution, a Washington, D.C.-based think tank. Wessel reminds us, however, that markets run on psychology, not just the fundamentals, and if investors react too strongly to any or all of these factors, their fear could become a self-fulfilling prophecy. And if businesses become overly cautious — i.e., stop investing and spending — that could cause the U.S. economy to contract and fall into a recession sooner than it might have otherwise.